Adding a spin to your website just involves pasting a single piece of HTML code that is easily accessible from your account into your website’s HTML code. Our spin viewer includes a number of adjustable parameters that control things like the size of the embedded spin and whether or not it automatically begins to rotate after loading. Mobile Optimized: Built using the latest web standards, our spin viewer will display properly on any browser and on any device. This will help you reach the increasing number of mobile users in a more engaging and interactive way. Flash Viewer Available: If your application calls for a Flash viewer, the Arqspin 360 photography system has you covered. Certain websites like eBay still require using Flash technology for any external embeds. 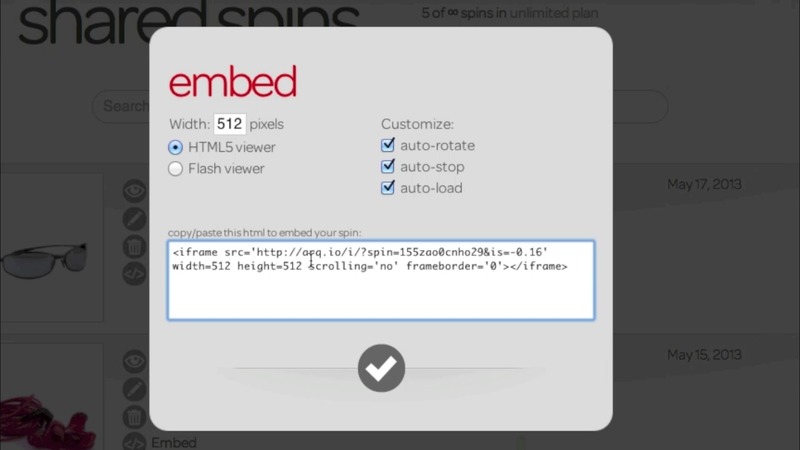 This type of embed code is easily accessed in your account page along with our default HTML embed code.